We've made some huge improvements to your apps' analytics! 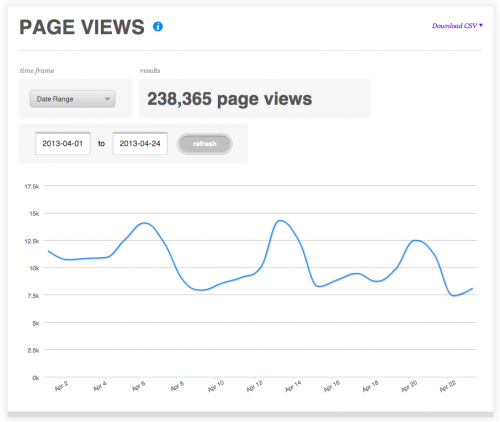 The Analytics section has been made a top-level navigation item in your CMS for easier access. Log in and check it out here. We've created a new Overview page that gives you a glance into your most important stats. Drill-down into graphs on individual pages. Conversion Rate Over Time — This is the click-to-conversion (purchase) ratio for all of your audio tracks. Pro tier customers have access to all graphs, including new ones we'll be adding soon. Core customers will only have access to App Downloads, Downloads by Platform, Popular Sections, Email Subscribers. Previous Core customers will only have access to App Downloads, Downloads by Platform, App Gallery Views, Audio Streams Over Time, Top Audio Streams, Video Plays, Most Watched Videos, Popular Sections, Section Views, Comments Breakdown, Unique Visitors, User Demographics, Email Subscribers, Share Stats, Music Sales Conversions, Conversion Rate Over Time, and Revenue.